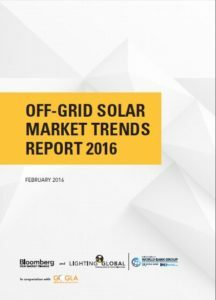 Today, there are 1 billion people worldwide living without access to the power grid and modern energy services. About half of these people reside in Sub-Saharan Africa alone. Collectively, they spend about US$27 billion each year on lighting and mobile phone charging with kerosene, candles, battery torches or other fossil fuel-powered technologies. These traditional solutions are expensive, harmful to health, hazardous and polluting. They resign the poorest people on the planet to a life of energy poverty which constrains economic development and impedes access to education, livelihood development, health, and basic services including communications, water, and transport. 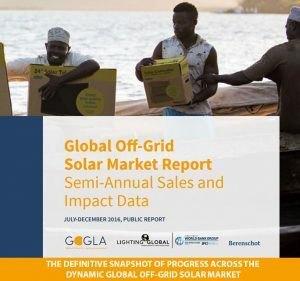 Lighting Global is the World Bank Group’s initiative to rapidly increase access to off-grid solar energy for the one billion people living without grid electricity world-wide. 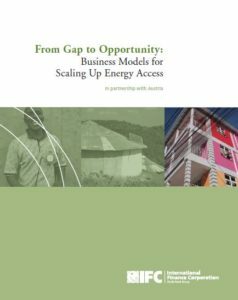 Lighting Global – managed by IFC and the World Bank, with support from the Energy Sector Management Assistant Program (ESMAP) – works with manufacturers, distributors, governments, and other development partners to build and grow the modern off-grid solar energy market. Quality Assurance: We created an international quality standard for affordable solar-powered devices and solar home systems, and we also advise manufacturers on the quality standards. Market Intelligence: We provide market intelligence that lowers the cost and risk for first movers entering frontier markets. Access to Finance: We facilitate access to finance for manufacturers, distributors, retailers and consumers. Business Development: We address impediments to the market’s development, and work with individual firms to scale their businesses, providing on-the-ground business-to-business support and linkages to build the last mile supply chain. Consumer Awareness: We raise consumer awareness about emerging solar products in nascent markets. Policy and Partnering with Government: We work with governments on their quality standards. Our work with the off-grid lighting industry began in 2008 with the launch of the first Lighting Africa pilot in Kenya. We’ve since expanded across the African continent and into Asia and the Pacific under the Lighting Asia program, and are currently developing a program in the Americas as well.